On January 14th, teachers in Los Angeles, represented by UTLA, the second largest teachers’ union in the country with over 30,000 members, went on strike. After years of divestment in L.A. schools, UTLA members and community partners took a stand to ensure that every student receives quality education. Their demands included what every school district in the state should provide: smaller class sizes, more nurses, counselors, psychologists, and librarians; competitive wages; and community schools and support for families. After a 6-day strike with massive teacher involvement and activism, and overwhelming support from students, families and communities throughout the district, the union reached an historic agreement with the district that included significant gains on almost every one of the union goals. While these organizing efforts and strikes are significant on their own, they are part of a larger #RedForEd teachers’ movement that was sparked by the West Virginia statewide teachers strike in February 2018. This movement has included mass teacher strikes and walkouts in seven southern and western states last spring that energized the nation, followed by numerous local union strikes in Washington state in the fall that resulted in raised teacher salaries by as much as 17%. Teacher strikes in L.A. and Oakland – large, diverse urban areas in the biggest state in the country – mark a new significant development in this growing movement. 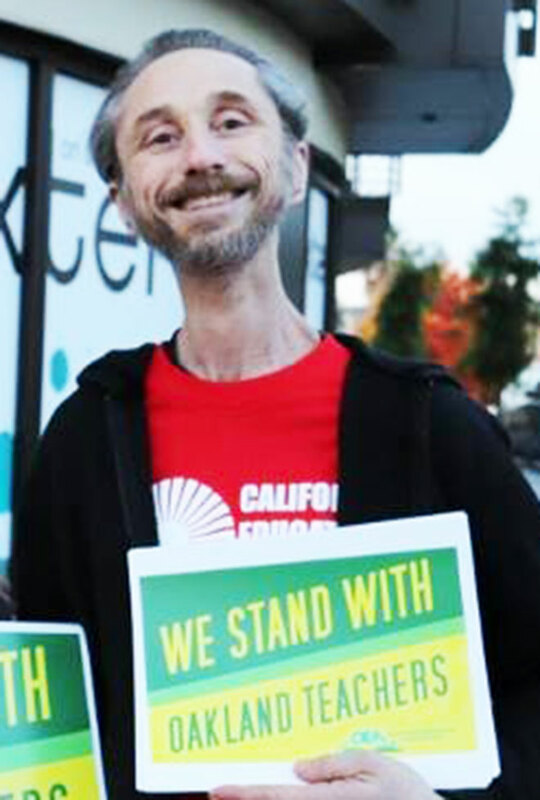 Over the past several months, CFT locals and rank-and-file activists have been building support and solidarity for L.A. and Oakland teachers and public education. On December 15, 2018, AFT 1493 members attended a solidarity meeting to support public education in Oakland organized by California Educators Rising that brought in over 250 teachers, union activists, and community members. The forum included speeches given by rank-and-file educators, as well as union leaders in support of public education, social justice, and the need to build solidarity with the Oakland and L.A. teachers’ contract campaigns and strikes. In addition, there were several break-out groups where participants were able connect with one another and discuss strategies to organize their co-workers at school sites, build community support, and incorporate arts and music into organizing efforts and protests. What is CA Educators Rising and how did it form? CA Educators Rising is a Facebook public page (also, Twitter and Instagram pages), with California Educators Rising (CER) as the accompanying closed Facebook group. The direct inspiration for this concept came about when I met Rebecca Garelli of Arizona Educators United (AEU), who co-founded another Facebook group, which was a key component of that state’s successful walkout and gain of a 19% raise last spring. At a “Red State Teachers Rebellion” forum, which I helped organize in Oakland last June, I met Rebecca and we discussed at length her process of co-creating and building AEU and the “Red for Ed” movement. I wanted to do this in California, and Rebecca was and still is, very encouraging and supportive. Another teacher in BFT was equally inspired by this idea, and we worked with her brother to design the logo that we’re using now with the state map and a rising sun, along with the hashtag, #CA1050Strong, referring to California’s 1050 school districts, and modeled after West Virgina’s #55Strong. We proposed the idea at a Bay Area UCORE (United Caucus of Rank and File Educators) meeting in October. In this small group, we got two other teachers to volunteer to start a committee to get the Facebook project started. We, along with a network of 20-25 active teacher organizers, are building a statewide network of educators ready and willing to fight – to support UTLA/OEA, and for progressively and fully funded public schools in California. CER has grown to having several committees with different educators running them, and holding periodic phone meetings with teacher organizers all throughout the state. We are rank and file led, and encourage site-based actions to develop rank and file leadership within locals. How does CA Educators Rising fit into the growing #RedForEd teacher’s movement? California Educators Rising is a direct result of an uprising that started in Chicago and resurfaced in West Virginia, Arizona, and subsequent other states and cities who are using the #RedForEd tactic to unify around the need to defend and transform public education. We see this as one national and even international movement to defend and transform our public resource of education. The time is right for California to go all in and join the movement. We are the wealthiest state in the nation but rank among the lowest in per-pupil funding and class size, and California is one of the most expensive places to live, so educators and families are really struggling. On top of that, private charter school interests, with their deep pockets and strong connections to elected officials, are a direct and serious threat to the fate of our public education system, especially in our most impoverished communities, consisting mostly of black and brown students. These big money privatizers are also a threat to trade unionism. The State Policy Network, the well-funded network of right-wing think tanks behind Janus vs AFSCME, has among its goals to “defang and defund” public sector unions. So, the need to protect and strengthen public schools is an equity issue being fought along class and racial lines, and it’s a fight we need to face head-on. This is happening all over the world, and California’s time is now, with UTLA and OEA, two of the largest educator unions in the state, planning to strike early in 2019. The next step is for the CER contact to reach out to the UTLA contact person, and ask what kind of support they would like. Some ways to support them are fundraising at union meetings and sites, or days of action. UTLA schools could use assistance with providing lunch to students who won’t be crossing the picket line and supplies for strike activities. Educators can email each other, learn about struggles at each others’ schools/unions and make signs directly about the other school. We are sharing curriculum to teach students about the UTLA strike and set up a penpal system to another teachers’ classroom. Supporting educators are encouraged to write notes of support to their adopted school and post on social media or share directly, become friends on social media, and tag each other in #RedForEd posts, “we stand with you”. We will extend this program to OEA if they go out on strike. In the meantime, we are promoting OEA’s actions and events, and highlighting key aspects of their struggle. What are the main priorities and issues that you are focusing on? We are focused on connecting union members within locals and across California, as well as nationwide, in an effort to raise consciousness to see the bigger picture, that when we unite around a common vision of defending and improving public education, along with our communities, and begin to take collective action, then we can not only win the funding for schools that our students deserve, but we can rebuild the labor movement more broadly. Are there any campaigns that you all are organizing around? We are organizing solidarity actions for UTLA and OEA with the goal of building capacity statewide to fight for and win the Schools and Communities First Act in 2020. At the same time, there are other issues that many locals face, such as charter school take over and over-testing, which we need to organize around statewide. How can community college faculty and unionists be in solidarity and get involved in this network? The Schools and Local Communities First Funding Act, if passed, would bring significantly more funding to community colleges. The most direct way to plug in would be to join California Educators Rising online and become part of the organizing team. Also, they could support any local union contract fights and social justice campaigns to defend our communities.